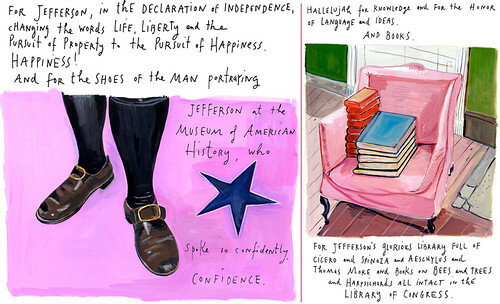 I’m excited, tonight I’m going to see/hear Maira Kalman speak at the AIGA. I love her work. I’m going with the talented Rachel Salomon. Kelly Carumbula will be there too. Should be a fun talk. I love her work so much. Here’s another post I did about her and The Elements of Style. Above are a couple of my favorites from her inaguration illustration series for the NY Times. it was such a great talk! I loved it, wanted to ask her so many questions but really enjoyed her. Nice to see you and Aaron! See you Sun.